If you have fallen lately, you are not alone. There are more than 11 million people over the age of 65 fall every year who fall -- that's 1 of every 3. With videos like "Scarlet Took a Tumble" going viral on youtube, a fall might not seem like anything too serious. 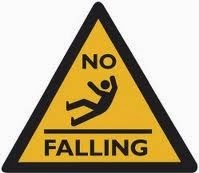 However, countless times as a nurse I see broken bones, internal bleeding and death, due to a fall. There are a handful of things that can be done to prevent a fall. The first step to fall prevention is to perform an assessment by walking the living space to see if you can fluidly go from room to room and from furniture to furniture. Do you have to navigate between furniture or avoid bulky shelves? Are there unmarked steps that have no side-rail? Is the lighting dim or the switch hard to find? All of the above are hazards. You may know that they are there, but when the going gets...well, going, these things can easily be missed. Brainstorm what can be done to reduce these hazards. Often, the simplest answer is the best answer. Instead of considering how to sell the bulky furniture, simply think how it came be arranged to where the legs are not within a high traffic walking area. Instead of throwing out flowerpots, simply put them on tables or shelves. A solid plan of action will make for easier implementation. Time to put your plans to action. Remove rugs, add a rubber mat to the bathtub, install ramps or handlebars and railings, and arrange furniture. Make sure the changes fit the lifestyle and reducing the risk of falls. Do another walk through and assess your changes. Ask someone else for a second opinion. This process of evaluating is continuous, as needs change and new norms are established. This plan of action for fall prevention can be applied to any location: home, hotel, hospital room, assisted living community, etc. Take advantage of these basic tips and prevent falls today. This post is in honor of my Aunt Sunny who passed away Sunday, December 2nd, 2013 after a fall. Her sunny spirit lives on in my family's memories. Join me Monday, December 9th, on Twitter to chat more about how to fall-proof the living space of your loved one. The TweetChat starts at 4pmPT/7pmET at #Nurseup. See you there!